Lafayette, Louisiana–the heart and soul of Acadiana–combines contemporary sophistication with a unique heritage and culture not found anywhere else. It is no surprise that Champagne’s Market, known for its wide selection of specialty foods and wines/liquors, is located in the city recognized for its rich variety of Southern and French cuisine. Recognized for outstanding service and cleanliness in the Acadiana area, Champagne’s Market is a well-known store in the community. In an effort to further the success of their market, Beth and Greg Champagne, who own Champagne’s Market as well as The Kitchenary at Heymann’s (conveniently located adjacent to the market), made the decision to adjoin the two locations. 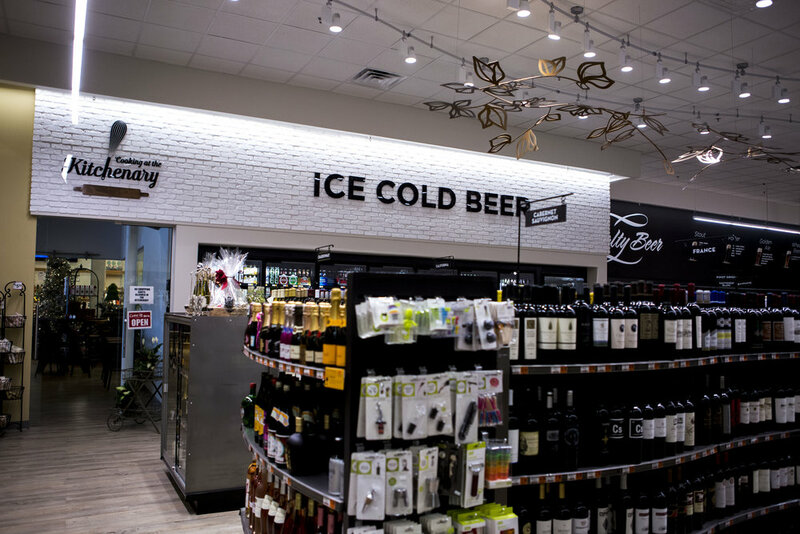 Decorworx was hired to design a new section for the market that would include an entrance to The Kitchenary, updated floral and dairy departments, additional freezer cases, a new specialty beer wall, and displays to showcase a wide variety of wine and cheese selections. In order to maintain consistency between the market and The Kitchenary, the modern and sophisticated feeling achieved in The Kitchenary was used as inspiration for the new section’s decor. The Champagne’s desired to attract a middle-aged, well-educated demographic which would be made possible with the addition of the high-end, high-quality décor. The décor for the new section of the store implemented a contemporary and mature style. The textures and colors incorporated throughout the design were modeled after the refined mood of The Kitchenary. Soft modern hues, acquired from a two-toned pallette and paired with neutral and metallic textures, perfectly complimented the beautiful simplicity of the section. Bold geometric and classic italic typefaces were utilized throughout the section to add balance to the modern mood. 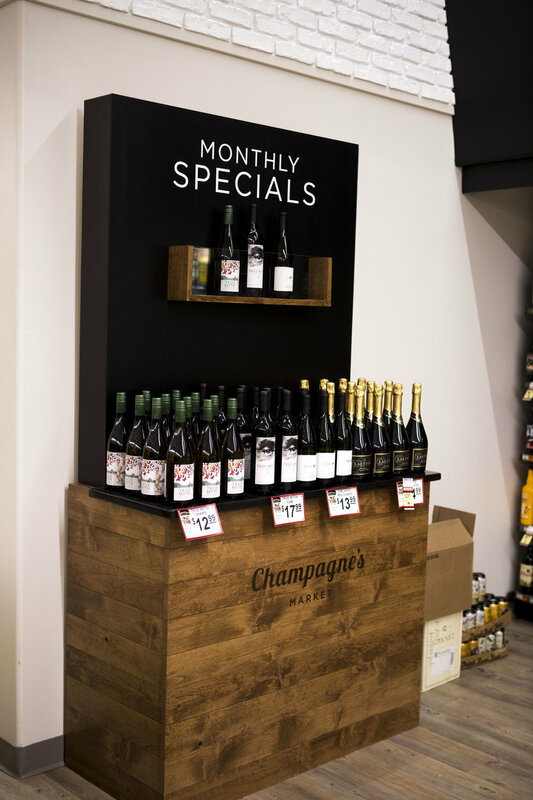 A delicate metal trellis was hung above the wine display and resembles a grape vine motif, adding a sense of style and sophistication to the section. Graceful, yet modern mood lighting dotted the cheese display, emphasizing the fresh and unique design. The new, updated section further facilitates the belief that customers are receiving high quality products from a grocer who is current and capable, as well as accomplished and experienced. The modern décor exceeded the Champagne’s expectations and was a welcome addition to their business.